Plimmerton Rotary have been privileged to enjoy a few days of hosting Rotarians and partners visiting District 9940, New Zealand, on an International Friendship Exchange from District 5020 which covers Vancouver Island, British Columbia, Canada, and Western Washington State, USA. The Pacific Northwest is a region in North-western America, bounded by the Pacific Ocean to the west and loosely, by the Rocky Mountains on the east. It includes the Western rim of the US State of Washington and Vancouver Island off the coast of the Canadian Province of British Columbia. The Pacific Northwest is a diverse geographic region encompassing a spectacular natural paradise of rocky shorelines, sandy beaches, ocean and mountain views, forests and parkland. The Region boasts world-class cities and picturesque towns, a rich cultural heritage that includes First Nations, active farming, fishing and forestry industries, a vibrant arts and entertainment community, unique shopping and dining opportunities, and a rugged beauty that is an outdoor enthusiast's dream. Team Leaders, Duane E. Edwards and Patricia (Patti) J. Edwards who come from Poulsbo, Washington, USA, 98370 and belong to the Rotary Club of Poulsbo, North Kitsap. When the Edwards’ arrive, they plan to be fully retired! 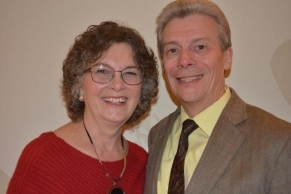 Duane has spent his 42-year career in commercial banking and Patti is a marketing consultant serving Christian non-profits. Duane and Patti have been married 12 wonderful years! They are the proud parents of five adult children and prouder grandparents of five grandchildren. They love doing things together, yet appreciate that each has their own interests. Patti loves to quilt, especially when the quilts are for others or to donate to charity. Baking, cooking and spending time with the children and grandchildren are other favourite hobbies. Duane is a true outdoorsman: he is a cyclist, avid hiker and boater. Both serve in their church’s ministries. The Edwards have a combined 36 years of serving in Rotary, holding various offices, including club and Foundation Presidents. Both are honoured to have received Paul Harris awards. They love to entertain and spend time with friends, usually centred around food and wine. Travelling is high on their “love to do ” list, and they hope retirement brings them more opportunities to explore around the globe. Geoffrey Crooks and Elizabeth Morrison come from Olympia, Washington, USA. Geoff has been a member of the Rotary Club of Olympia since 1982. Over the years he has chaired and served on various club committees and for a time wrote the club bulletin. He and Beth have also enjoyed hosting Group Study Exchange teams. Beth and Geoff live in Olympia, the capital of Washington State (the “other Washington”) at the southern end of The Salish Sea. Geoff, a lawyer by training, retired in 2006 after 27 years as Commissioner of the state supreme court. Beth meanwhile phased out from financial and dispute resolution roles. Since retirement Geoff has volunteered, typically as a board member, at nonprofits Community Youth Services, Harlequin Productions, Habitat for Humanity, and Wolf Haven International. Beth “hates being on boards!” but can always be found lighting fires to promote civic, educational, or philanthropic projects — usually several at once. Beth and Geoff, married for nearly 20 years, share kids and grandkids in Seattle, California, and France. They see theatre every chance they get, travel widely, are semi-serious birders, enjoy a home filled with eclectic collections of art and textiles, and argue about cooking. Gill and Chris Campbell come from Nanaimo, British Columbia, Canada where Gill is a member of the Rotary Club of Nanaimo North. Gill came from a Rotary family, joining soon after the opening to women came. She and Chris came to Canada after an English childhood and Welsh education. In addition to life in Newfoundland and Labrador and in British Columbia, they lived in France and Gill studied briefly in Sweden. Their two boys are independent businessmen in British Columbia. Gill has been an entrepreneur since she was 24. Her creativity led her to build the largest cottage industry in Atlantic Canada, selling handmade products across the country and in the US. This was one of the four businesses she built and sold. The high point in a career that empowered many was perhaps the day one of her knitters came to thank her for the opportunity to have bought her husband a Christmas gift, with her own money! Chris has had a series of Marine industry-related careers, in research, education and business and economic development. Both lead an active life. After many years of racing sailboats, they now cruise a 36-footer in BC. After a workaholic life and work travel, exploration travel is a new discovery, as are holidays! 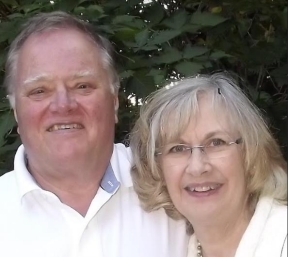 Donald (Don) and Cheryl Rugg come from Victoria, British Columbia, Canada. Don is a charter member of the Rotary Club of West Shore, has served as President twice in 2005-2006 and 2016-2017 and is a retired agricultural consultant. 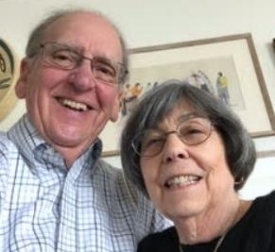 Cheryl has recently retired as a massage and Hurley/Osborn practitioner and she and Don have been married for 50 years. They have lived in Colwood, a Victoria suburb, for 42 years. Don has been active in the local curling association where he not only curls but coaches the junior programme and an adult learn to curl programme started 6 years ago. Cheryl is an active participant with her local Jehovah’s Witness congregation and loves to garden, sew and help Don with various woodworking projects. Both have been avid hikers. Don and Cheryl have two children, son Brad and Diane in Victoria and daughter Stefanie and Joel in St.Kitts plus two grandchildren with Skye taking medicine at Wollongong University in Australia and Calvin working as a diesel apprentice with a Sidney marine company. Dale and Janet Dorward come from Port Hardy, British Columbia, Canada. 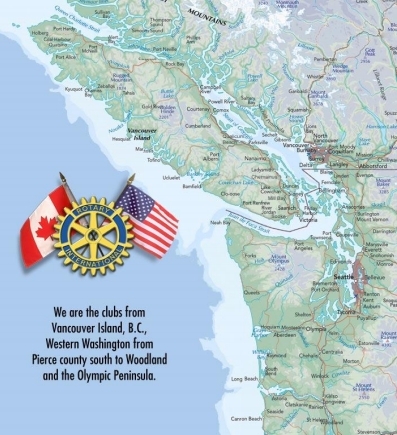 Dale and Janet are both Rotarians in the Rotary Club of Port Hardy, a coastal town of 5000 at the northern end of Vancouver Island. Dale has been in Rotary over 30 years, is a past president, has served in nearly every role and continues to be a key part of the club’s very successful annual auction. He currently serves as Treasurer. He has operated his busy tool and equipment rental business for 40 years. Dale is often volunteered for his MC services or fast-talking auctioneering talent. He also loves to golf, fish, problem- solve, dance, sing, and hike (sometimes all at once). Janet has been a Rotarian for 17 years, is also a past president and now serves as Club Secretary. She is a commercial insurance broker of 27 years and is the organizer of the local hiking club. When not out adventuring, she enjoys most anything active - running, cycling, dancing, and fishing. 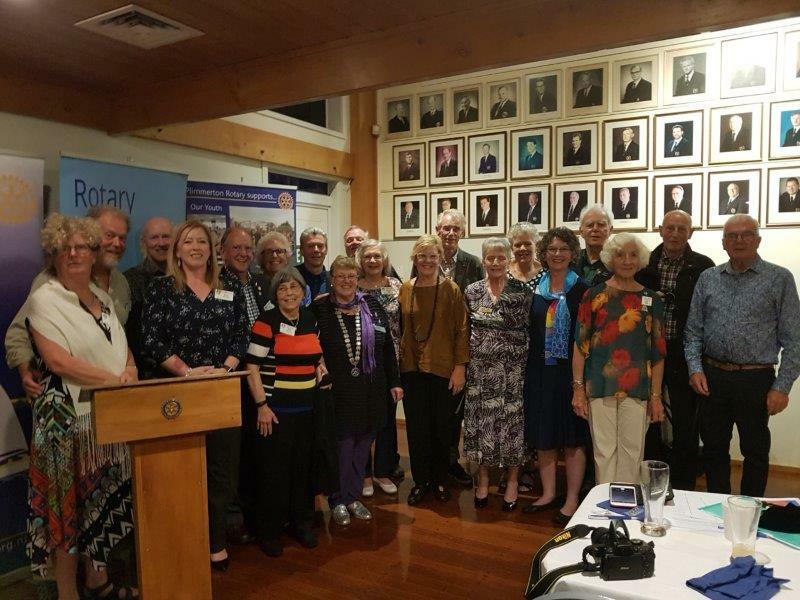 The visitors' time with Plimmerton Rotary concluded with a larger than life weekly meeting where the fun and laughter raised the noise levels to entirely new heights. Original generation time 1.7179 seconds.